Let me start by saying that I’m not a big fan of chicken breasts. They are my least favourite cut of chicken. I find them to be dry and lacking in flavour and I avoid using them as much as I can, opting for thigh fillets instead. But this recipe from the Barefoot Contessa has converted me. The chicken is bathed in olive oil that’s been infused with garlic, lemon juice and herbs, quite a lot of garlic and oil actually, but don’t be tempted to cut down on either. 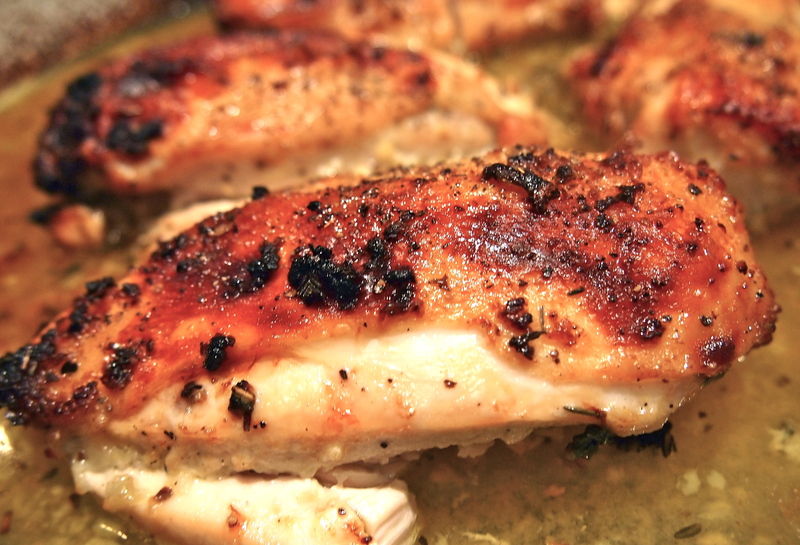 It’s this rich oil that the chicken is baked in that stops it from drying out and at the same time infuses the meat with all it’s lemony garlic flavours. The only change I made was to add a hint of honey to counteract the lemon juice and to help the skin to crisp to a nice golden brown. This is cooking at it’s simplest and best. After very little effort you’re rewarded with a truly delicious meal of succulent chicken meat and a lovely thin sauce to drizzle over. I’d happily serve this for guests but you can’t beat it for an easy mid week meal. I had a large number of people for dinner recently and I served this with a baked pumpkin and sage risotto that required no stirring whatsoever – a truly simple and stress free way to feed a crowd. Preheat the oven to 200C. Warm the olive oil in a small saucepan over medium-low heat, add the garlic, and cook for just 1 minute but don’t allow the garlic to turn brown. 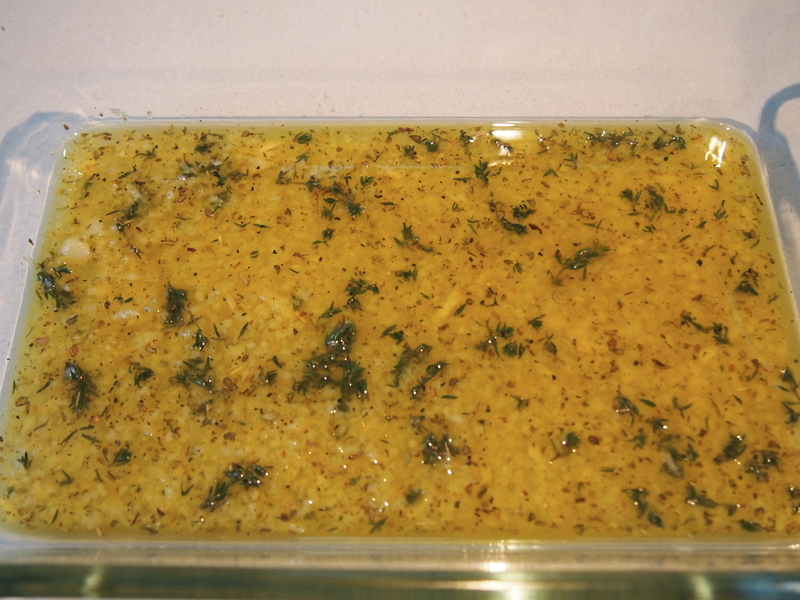 Off the heat, add the white wine, lemon zest, lemon juice, oregano, thyme, honey and ½ teaspoon salt and pour into a baking dish that will fit the chicken breasts snugly in one layer. Pat the chicken breasts dry and place them skin side up over the sauce. 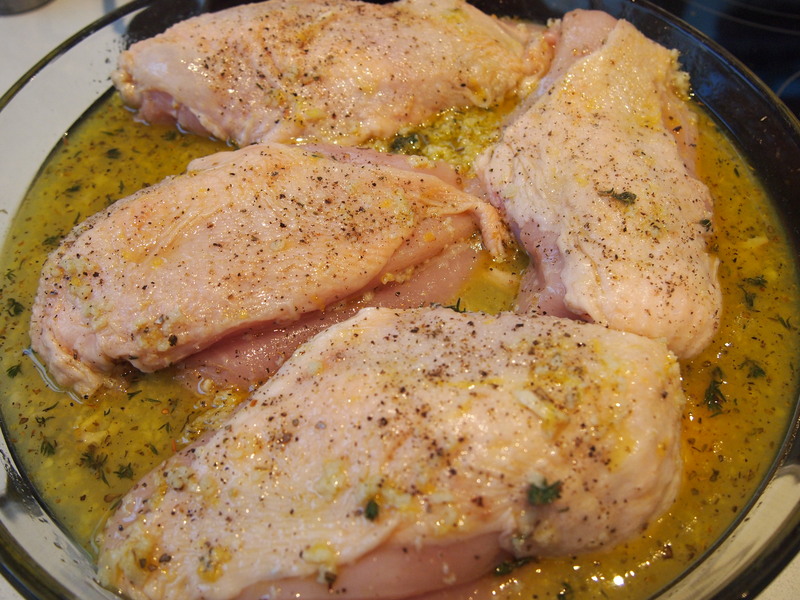 Brush the chicken breasts some of the infused oil in the dish and sprinkle them liberally with salt and pepper. Bake for 30 to 40 minutes, depending on the size of the chicken breasts, until the chicken is done and the skin is nicely browned. If the chicken isn’t browned enough, put it under the griller for 2 minutes. Cover the pan tightly with aluminum foil and allow to rest for 10 minutes. Serve hot with the pan juices. I gave this dish a whirl and it worked out beautifully! I’m not a very good/experienced cook but I found it so easy and so tasty – thank you ! Alison, sorry that your chicken didn’t turn out. If you look at the recipe you’ll see that it states to pre-heat the oven to 200C. It was not a typo. There is Celsius temperature and Fahrenheit temperature. 200C is equivalent to 400F. So the recipe is correct as it stands. I always post in Celsius as I live in Australia and that is the metric system that is used here, and in 90% of the world. Hi! 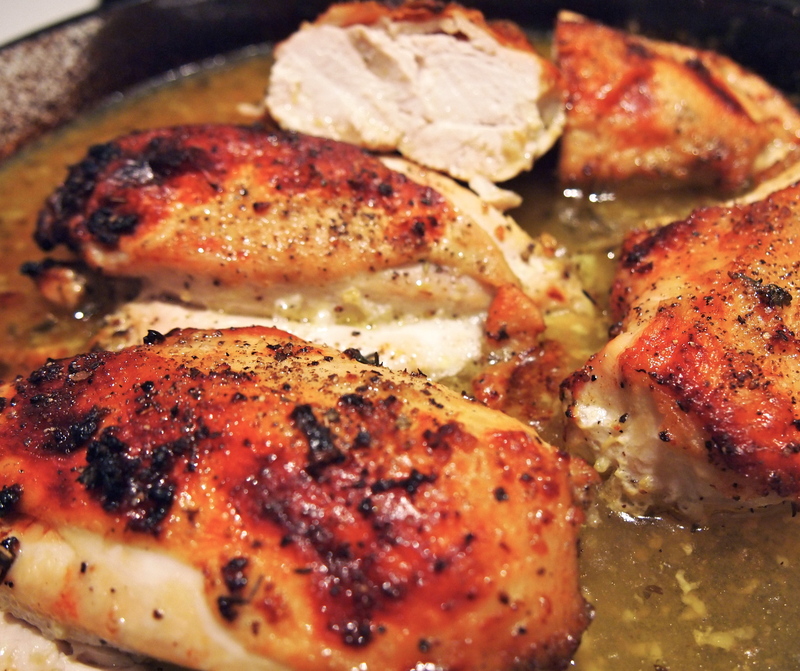 I am eager to try this recipe but having the hardest time finding boneless chicken breasts with skin on. All the boneless chicken breasts are also without skin. I am finding split chicken breasts with some ribs attached. Would those be OK to use for this recipe? Sorry if this is a silly question but I am a new cook! Hi Jasmine, thank you for your lovely comment. Regarding boneless skin on chicken breasts – yes, I know they can sometimes be hard to come across. I’m not sure where you live but if you are in Australia try going to a poultry store (there is normally one in every shopping centre that has a food court/supermarket) or a butcher – supermarkets don’t tend to carry them. But the breasts you have found with some ribs still attached would be ok. In actual fact with a nice sharp knife it wouldn’t be too difficult to cut out the ribs. Good luck and hope you enjoy the recipe! I’m in California and went to another store this afternoon where I found the same. You are right that the ribs should be easy to cut out. I watched a couple of videos on YouTube showing how to debone a chicken breast. Not too hard so I feel less intimidated. I am looking forward to cooking this recipe and others from your site. I love the photographs and detailed instructions. And you write beautifully!